Sure, sourcing parts is no problem! 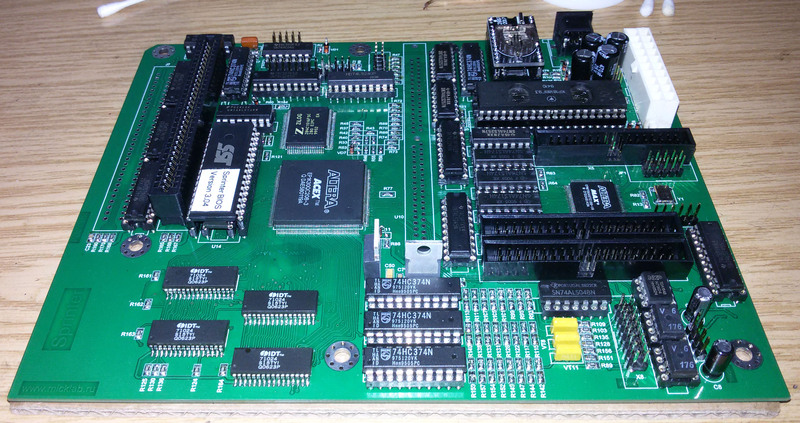 PCB plus Interwave is fine. Bad news everyone! Slight delay with the production, as the first audit "failed" due to the producer being unable to exchange one of the gerber files. On the positive side ... there won't be any annoying visible "pool marker" on the board. EDIT: Never mind ... seems like they went full speed on the audit this time and sent the board off to production already after re-ordering. shock__ wrote: Bad news everyone! Slight delay with the production, as the first audit "failed" due to the producer being unable to exchange one of the gerber files. Great news, I hope there will be enough cards for everyone, I joined this forum just to follow up with the development of the gravis clone, I never thought you will go this far! Where can I sign up for one of these please? Shipping will be a bit delayed ... probably after easter. I'll PM you once your board has been shipped. I think the PCBs look lovely. I don't really understand what you mean about the pool marker being visible, but they do look really nice regardless. I guess this means we need to order some components so we can build and test these cards, is there a spreadsheet or parts list thats up to date? Whiskey wrote: I don't really understand what you mean about the pool marker being visible, but they do look really nice regardless. I guess this means we need to order some components so we can build and test these cards, is there a spreadsheet or parts list thats up to date? JLC puts a tiny text (like a serial number) on the PCBs, to track quality complaints and such. I never minded them before, but if you don't want them they need to silkscreen them where e.g. an IC will be placed. Yup, that's what I originally set the "JLCJLCJLCJLC" marker under the main IC for ... sadly looks like they missed or ignored it. Also thanks for reminding me to upgrade the parts list ... it should be the same as for prototype #2 except for 2 more 10k or 0 ohm resistors and the additional 2x5 header for ESP/SPDIF. You can tell them to put the marker to a specific area. An aquaintance suggested putting the message into the gerbers themselves. Tiido wrote: You can tell them to put the marker to a specific area. An aquaintance suggested putting the message into the gerbers themselves. Which is exactly what I did ... after they cancelled my original order, so I could add it again. If they said "better luck next time" I'd have been ok with that. Now I have 2 markers and ended up with a 3 day delay. Meh. But these are still just beta boards so no big deal. Things happen. Not like it is going to affect the functionality in any way. On a few boards, I actually scraped very carefully with a sharp, stiff blade. When the deed was done, you could hardly tell that anything had been there, and there was very little observable effect on the solder mask. When dealing with smaller boards, you can save a few dollars by creating your own panels. I did that with one adaptor board I used for my early ROM module experimentation. I got 20 of them for the same price as five, and the marker was placed on the break-off tab above the usable boards. Now that I've done that successfully, it may be a way to cut costs on future ROM module production. 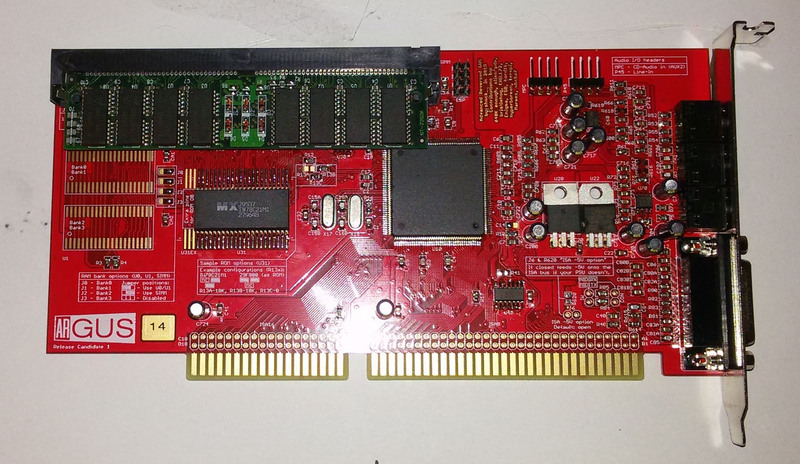 Only fyi: I just ordered a couple of PCBs for another card from elecrow in SZ, which I'm gonna populate over the next days to test: They didn't put any pool marker on this batch. Only did major testing so far (output via demo/xtc-play, RAM test, ROM dump + checksum), but looks like no new issues were introduced. Meaning the design is final unless something severe pops up. EDIT: Updated partslist will follow tomorrow. shock__ wrote: Meaning the design is final unless something severe pops up. We'll have to pay special attention to the 4-MiB ROM bank again. I suspect that the resistor changes will fix the problems with the previous prototype, but I'll only be fully convinced when I hear it.